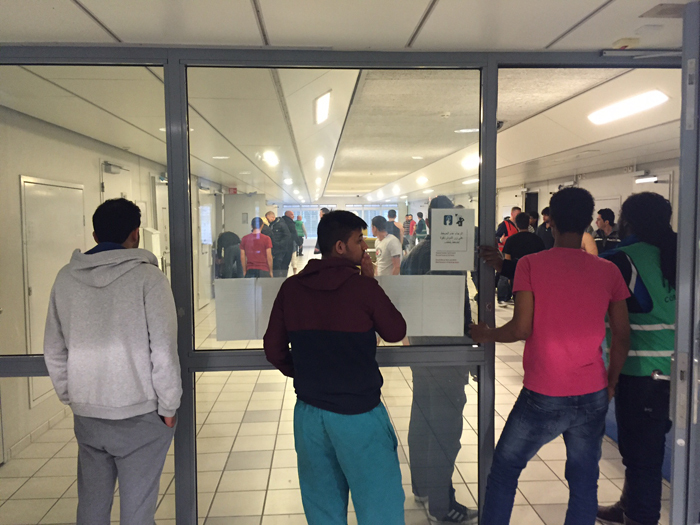 Tension spills over among refugees housed in Alphen aan den Rijn prison in the Netherlands. from Warscapes on Vimeo. Almost all refugees in the Netherlands have transfered from one camp to another several times during the asylum seeking process. It’s the fourth time that I’ve been given a new place to stay during last five months - this time in a real and big former prison. Approximately 1,200 refugees, including families and gay refugees, are living in close quarters in isolation [from the community] in this big prison in Alphen aan den Rijn. Refugees are living in small and depressing cells, two meters by two meters, with doors which you cannot lock, so your belongings aren't safe when you are away for a while. We had many cases of cell phones being stolen - the only thing refugees have to get in touch with families and friends in their homelands - but the authorities didn’t care. Although we have CCTV cameras all around the prison and in the salons, the COA [Central Agency for the Reception of Asylum Seekers] uses them just for emergency cases. Refugees look on after an Iraqi man attempted suicide in Alphen aan den Rijn. Every day, refugees are given one serving of the same food, which you must put it in microwave. There are no alternatives; refugees must accept what they are given. It’s really just something to fill the stomach. Some refugees have money and are wealthy, but not most of them. It is permitted to go outside the prison, but not so far, and most don't have money to go further and buy things. Earlier this week, two Syrian refugees started fighting in the prison, with other refugees, over whether they'd join them for a big protest against the COA. If refugees were told for how long they would have to wait like this, it would be more tolerable and lessen the suffering, but the problem is every day we get up in our cells, and we really don’t know for how long we're stuck in this situation. Most refugees are coming from war zones like Iraq, Syria and Afghanistan, sometimes with family members left behind in danger. They have always lots of things to think about. They didn’t expect Europe would treat them like this. I think it's Holland's policy on refugees - to force them go back voluntarily to their countries. Some days ago [prior to the latest suicide attempt], a man stabbed himself in the chest in an attempt to commit suicide and was moved to hospital. Another Iraqi guy hanged himself from the roof and committed suicide in the west part of this prison a couple of months ago. The COA is trying to keep refugees concentrated in this camp, but journalists and activists are now trying to put pressure on the COA to change its policy on refugees. As a result, there are negotiations to close this prison and transfer refugees to a better place with more facilities, but the outcome is uncertain.